Rants, reviews, and resources to help sustain sustainable eating. 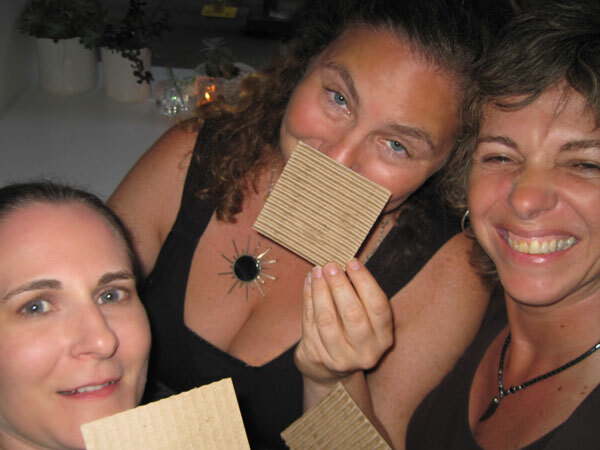 Playing hide and seek with corrugated cardboard coasters (recycled we assume) and feeling giddily green at ABC Kitchen. Kids in camp meant very unsustainable (albeit delicious) week eating out. On our way out of Rosa Mexicana, where we ate gobs of guacamole (don’t want to think about where those piles of avocados came from) we stopped in to have a drink at ABC Kitchen. Located in the ABC Carpet building, ABC Kitchen is the newest endeavor of Jean-Georges Vongerichten — it looks like farm-to-table eating for movie stars. Reservations take about a month to get, and I probably will indulge, but if you want to hear about the restaurant from someone who actually ate there, check out this New York Times Review. All I can tell you was that the ambiance, the company, and the ginger margarita were all amazing. I’m sort of out of it about what’s hot in NYC. (Remember, I’m normally home trying to make my kids eat Quinoa.) So I started surfing around to dig up info about what is clearly a new hot restaurant. The url for ABC kitchen is abckitchennyc.com but when I went there I saw that the restaurant was only one fork in some multi-pronged capitalist venture that includes the ABC Carpet store, the chain Belgian bakery le pain quotidien and the ABC Home & Planet Foundation which smelled a bit like a tax shelter to me. I have no evidence to back this up. And I don’t want to trash them, they seem to be giving lots of money to good causes. But when I clicked on the link to the NPR press about ABC Home & Planet Foundation I ended up at banner ad telling me I could save up to 75% off a new rug or home accessory. Still, despite my cynicism, I do believe it is in our best interest to make as public as possible the farm to table philosophy. And by creating aspirational culinary experiences, like ABC Kitchen it helps to mainstream more eco-friendly eating. I guess, what I’m trying to say is that, while ABC Kitchen communicates community and pleasure, I wonder if the community it is catering to is actually the people carving out a new social and economic spaces? Or is it trying to make a certain type of person in a certain social class feel comfortable about living in the status quo except on special occasions. And, although the ABC kitchen is a bit in the special treat section of my budget, I definitely put myself in that category. In the end, I guess I see ABC Kitchen in the same way I see organic milk at Wal-Mart. Not a solution but definitely some sort of step in the right direction .